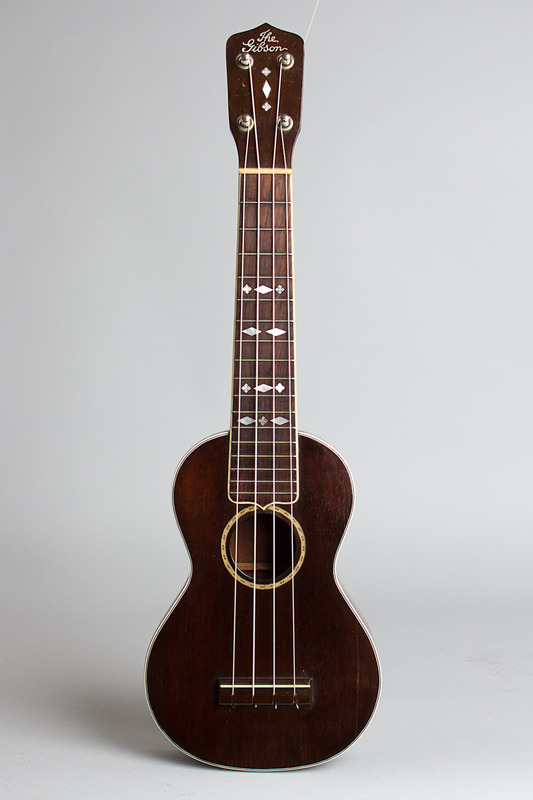 Gibson Uke-3 Model Soprano Ukulele, c. 1928, made in Kalamazoo, Michigan, natural mahogany finish, mahogany body and neck, rosewood fingerboard, chipboard case. 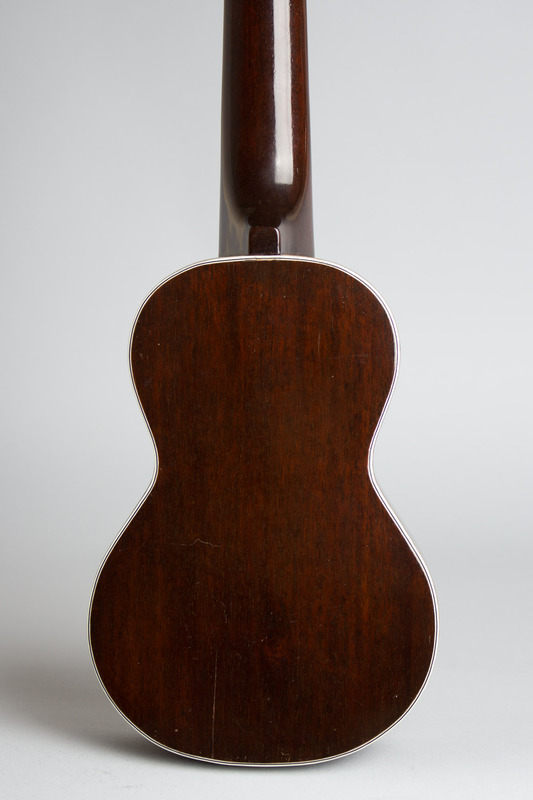 This is a very nice example of the 1920s Gibson "Uke-3," the company's top-of-the-line ukulele in the 1920s. 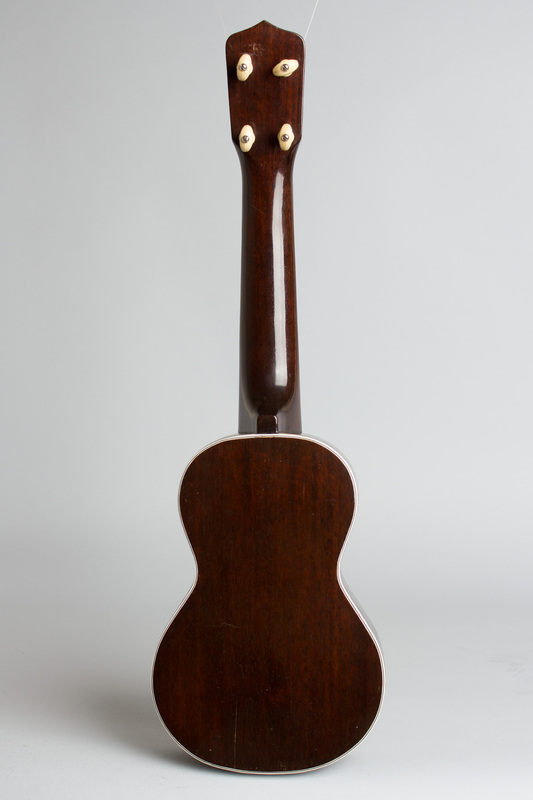 This model was the fanciest ukulele Gibson offered as a stock model, although the company would occasionally build hand-painted custom ukes on special order. The Gibson ukulele line wasn't even launched until 1926, quite late in the game. 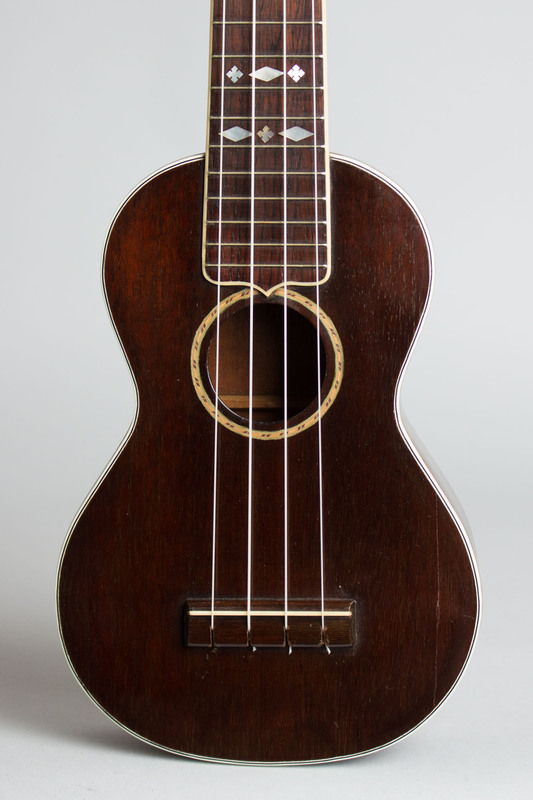 The company likely missed thousands of potential sales by sitting out the uke craze of the early 1920s, allowing Martin to dominate the higher end of the market. By the time Gibson's ukuleles were on dealers' walls, the craze had started to wane, and these Kalamazoo-made ukes are now much rarer than the equivalent Martins. The Uke-3 sold originally for $20, but is somewhat stylistically similar to the more expensive Martin Style 3, even perhaps a bit flashier. It features all-mahogany construction with a very dark finish, a triple-bound body, colored wood sound hole ring, and a bound, pearl diamond-inlaid rosewood fingerboard. 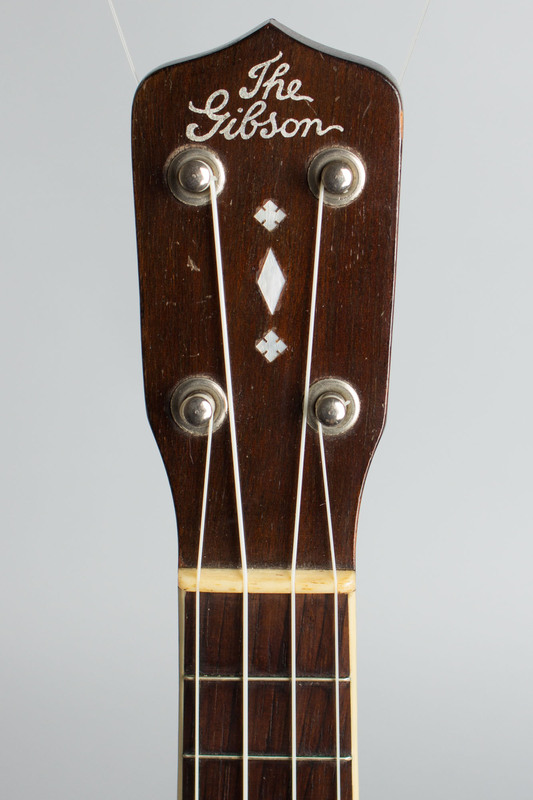 The nut and saddle are bone and the headstock has silver paint stencil "The Gibson" logo above pearl diamond inlay and is fitted with Grover "Simplex" friction tuners. 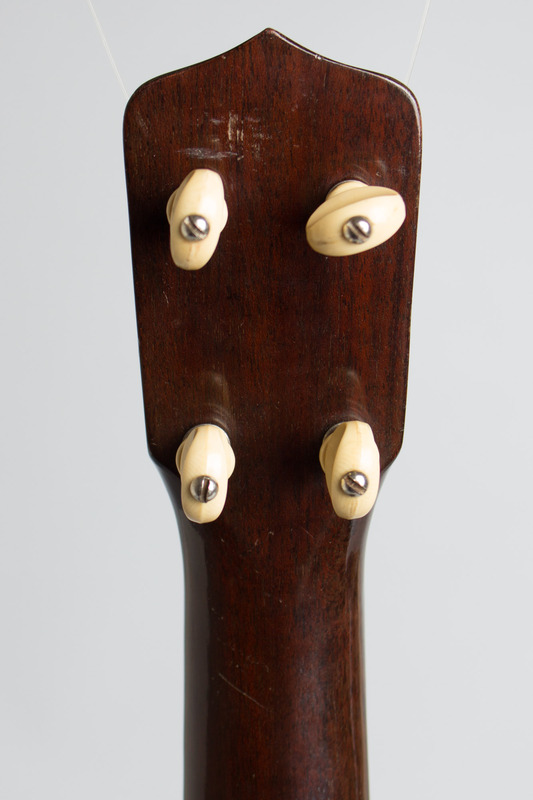 This last piece of hardware dates this example to the later '20s, when these tuning pegs first became available. Gibson ukuleles can be somewhat inconsistent but this one is very lightly built, making for a super nice-sounding uke and an awfully cute piece of 1920s Gibsonia! Overall length is 20 3/8 in. (51.8 cm. ), 6 3/8 in. (16.2 cm.) wide at lower bout, and 2 1/4 in. (5.7 cm.) in depth at side, taken at the end block. Scale length is 13 3/4 in. (349 mm.). Width of nut is 1 7/16 in. (36 mm.). 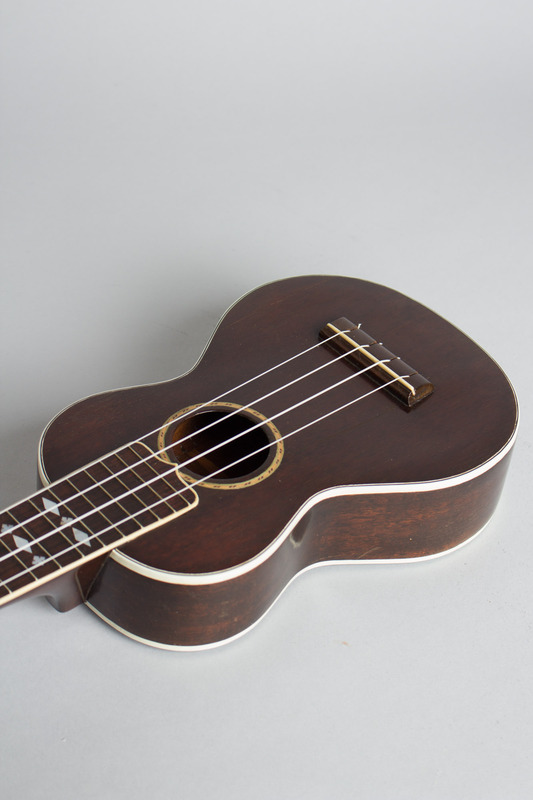 This uke is very clean overall with only minimal finish wear and does not appear to have ever been played much. There is one repaired grain crack to the top on the treble side; solid but not finished over or touched up, so plainly visible. There is one smaller repaired grain crack to the back as well, and a tiny rim crack on the bass side waist. None of these affect the instrument in any functional way and this is an excellent-playing uke with a very fine sound -- loud and punchy, but still sweet. It is currently housed in a 1950s-'60s grey chipboard case. Excellent - Condition.